Dell Latitude e7450 supports 4k 60Hz 4:4:4 chroma via hdmi? Hi I am planning to buy samsung 43 inch NU7100 UHD TV(https://www.samsung.com/sg/tvs/uhd-nu7100/UA43NU7100KXXS/) which supports 4k 60 Hz 4:4:4 chroma via hdmi. I have a dell latitude e7450( i5-5300u processor, 8gb ram and intel hd graphics 5500). Will this laptop support 4k 60 Hz 4:4:4 chroma via hdmi? So what does this mean? I cannot use the hdmi port on my dell laptop? So then will 4k 60 Hz 4:4:4 chroma work if I use mini-dp to hdmi connector where I connect to mdp port of laptop and hdmi port of Samsung tv? The max resolution specs of the processor's built-in GPU does not necessarily mean that all of the display outputs it is wired to will be able to run that. 4K 60 Hz 4:4:4 requires HDMI 2.0, which didn't exist when the Latitude E7450 was developed. Dell only started offering HDMI 2.0 on laptops around mid-2018, and systems that have it specifically mention HDMI 2.0. The spec you found notes that even the CPU/GPU itself only supports HDMI 1.4, which means you could run 1440p at 60 Hz or 4K at 30 Hz through that output. As for Mini-DisplayPort, that output does have enough bandwidth to run 4K 60 Hz 4:4:4. However, it seems that simple Mini-DisplayPort (and USB-C) to HDMI cables can't handle HDMI 2.0 specifically. I'm not sure why, but I do see various "active" adapters that include a converter chip in the dongle itself to achieve what you want. This is one example made by Plugable, which has a solid reputation for quality products. There are also "active" cables that have a converter chip built into the cable itself. I once tried a passive USB-C to HDMI cable to a 4K HDR TV, and although I could run 1080p 60 Hz and 4K 24/30 Hz just fine, if I enabled "Deep Color Mode" on the TV's HDMI input to unlock 4K 60 Hz 4:4:4 support and tried to send that from my laptop, the signal became very unstable. So I guess that's why the active adapters like that exist. Lastly, note that even with an active adapter, you would NOT be able to use HDR, aka 10-bit color rather than the normal 8-bit. DisplayPort 1.2 doesn't officially support the HDR10 standard, and in fact it doesn't even have enough bandwidth to run an HDR signal at 4K 60 Hz. Thanks for your reply. The active cable you mentioned(https://www.amazon.com/Plugable-DisplayPort-Supports-displays-3840x2160/dp/B00S0BWR2K) does my dell laptop support it cause the laptop spec just mentions mini display port, more specifically Dual-Mode DisplayPort (DP++) ( not sure if it is thunderbolt2 or display port 1.2/1.3/1.4)? If it does support then I need to buy a good hdmi 2.0 cable along with your mentioned active adaptor to make it work with 4K 60Hz 4:4:4 chroma(ofcourse without hdr) right? DisplayPort++ means that you can connect regular (passive) DisplayPort to HDMI/DVI cables or dongles, and the system itself will switch to native HDMI/DVI signaling. DP++ support is very common on PCs, but again, it seems that this mechanism isn't feasible if you're trying to use a resolution that requires HDMI 2.0. By comparison, with an active cable/adapter, the system always outputs regular DisplayPort and a chip inside the cable/adapter itself performs the conversion to HDMI/DVI -- so with an active cable/adapter, you don't actually need DP++ support in order to use an HDMI display from a DisplayPort output. This is handy because some USB-C or Thunderbolt to DisplayPort adapters don't support DP++, and at least in some cases AMD EyeFinity requires that the GPU be sending native DisplayPort to all displays. In those cases, an active adapter allows you to continue using an HDMI/DVI display because from the system's perspective, it's always sending native DisplayPort. You don't have Thunderbolt 2. As for DisplayPort revision, it would be 1.2 because DP 1.2 has been around for roughly a decade, and even most brand new systems still only support DP 1.2 because Intel GPUs on the market today don't support anything newer yet, although that will be changing soon. The only laptops that support a higher revision have their display outputs wired directly to a discrete GPU, but that setup is rare. However, DP 1.2 is enough to run 4K 60 Hz 4:4:4. So as I said, yes that active adapter plus an appropriately rated HDMI cable (look for things like 18 Gbps, High Speed, or 4K HDR) should be everything you need in order to run your desired setup -- again assuming there aren't any issues on the TV side like I encountered with that LG OLED I tried to use with 4K 60 Hz. Once again thanks for replying quickly. I understand that passive cables may not work properly. However while checking out the active adapter that you suggested, I stumbled upon this passive cable ( https://www.amazon.com/DisplayPort-Thunderbolt-Compatible-Display-Gold-Plated/dp/B0731GNYCN?ref_=bl_... ) and the specs and review comments suggests that it supports 4k 60Hz 4:4:4 via dp++ and thought that I can try it out. What do you say? edit: This is a mini dp to dp converter. Not mini dp to hdmi as I misread. Anyway this will not work for my TV. That cable is Mini-DisplayPort to DisplayPort, not HDMI, which is why it can do 4K 60 Hz as a passive cable -- but your TV probably doesn't have a DisplayPort input. It's true that active cables can be problematic, but it's also the only way you'll get a 4K 60 Hz HDMI signal out of that system because your system doesn't have a native HDMI 2.0 output, so if the active cable doesn't work, then nothing will on that system. The only exception would be a DisplayLink adapter, but DisplayLink has some significant drawbacks. At this point I feel I've already made a recommendation for you and spent a fair amount of extra time explaining it. So if you want to take my advice, then take the advice I've already given you. If you want to keep questioning my advice, then you should probably be asking for advice from someone else instead. But either way, I've given you all of the insight I can at this point. After buying high speed hdmi cable( amazon basics high speed HDMI 2.0 cable 3ft), I was able to get 4k 30Hz 4:4:4 chroma since the laptop supports only upto that through hdmi. 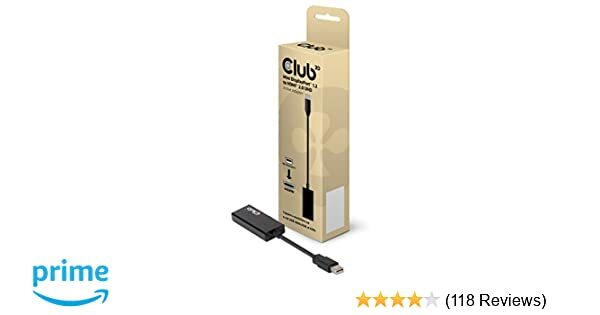 Then I went ahead and bought Club 3D, CAC-1170 mini display port to hdmi 2.0 active adapter (https://www.amazon.com/gp/product/B017BQCUGW/ref=ppx_yo_dt_b_asin_title_o00_s00?ie=UTF8&th=1). After connecting the adapter and hdmi cable it was still showing 30Hz even though I enabled HDMI UHD mode(and PC game mode) in TV setting. Then the adapter had a small piece of paper which gave some tips on how to get it to work. I needed to create a custom resolution in laptop intel graphics settings page with 3840x2160 at 60 Hz and timing standard as CVT-RB and then it worked. @sim_dell, glad it works now, and I told you that a regular MiniDP to HDMI cable wasn't going to work. Although I'm not sure why you bought that Club3D adapter when the Plugable adapter I linked earlier is less expensive as of this writing. Regular(passive) miniDP to HDMI cable I didn't try since you suggested it might fail. The total price of clud3d was cheaper(shipping+import duty) when compared to plugable.